Prime Minister Manmohan Singh today said there was a need to evolve a common understanding on autonomy and self-rule for the state of Jammu and Kashmir and an arrangement can be found within the vast flexibilities provided by the Constitution which provides real empowerment and comprehensive security to the people of the state. Should there be a retrial in the Jessica Lall murder case? Life in Kashmir remained crippled for the second consecutive day today due to a strike call given by the hardline faction of the Hurriyat Conference in protest against the round-table conference on Jammu and Kashmir convened by Prime Minister Manmohan Singh. Shops, business houses, banks, semi-government establishments and courts remained closed and vehicles were off roads. The government is not letting its guard down despite all 95 samples testing negative for human avian influenza. At the same time, it has said that reports about two fresh cases of bird flu in a poultry in Uchhal in Surat district of Gujarat actually pertain to samples that had been previously sent for testing to Bhopal. Two labourers were killed today and five others injured, one seriously, when they got buried under a mass of earth at a construction site of the micro-hydel project on the UBDC canal, about 10 km from Gurdaspur. 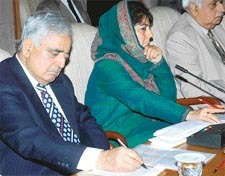 There is need to evolve a common understanding on autonomy and self-rule for Jammu and Kashmir. A fresh controversy has arisen in the Jessica Lall murder case with the surfacing of a letter written by the then Joint Commissioner of Police, Mr K.K. Paul, to the Commissioner, Mr Ajai Raj Sharma, suggesting an internal probe against officials investigating the case. A surgeon’s deft fingers have helped him achieve a unique feat — 85 operations in a day, that too without a break. Ajay Prakash started the marathon feat on Thursday afternoon at a hospital here, using a minimally invasive surgical technique described by him as “uncomplicated, efficient and time-saving”. Continuing its dominance on the awards circuit, Sanjay Leela Bhansali’s “Black” tonight bagged a lion’s share of the awards at the 51st Filmfare Awards night. It won all major critics and popular awards, while it won the critics award for Best Actor and Actress for Amitabh Bachchan and Rani Mukherjee, respectively, as well as the critics award for Best Film and Best Director award for Sanjay Leela Bhansali.